Carolyn Braun said she enjoys powerlifting because she can clear her head, unlike her work as a rabbi, which requires juggling many tasks. WESTBROOK — Carolyn Braun enjoys powering through obstacles. At 4 feet 9 inches, she isn’t what comes to mind when one imagines a powerlifter. The petite Portland woman is part of a new movement taking over the male-dominated sport. “It really breaks the glass ceiling – the stained-glass ceiling,” she said while laughing at her own joke. 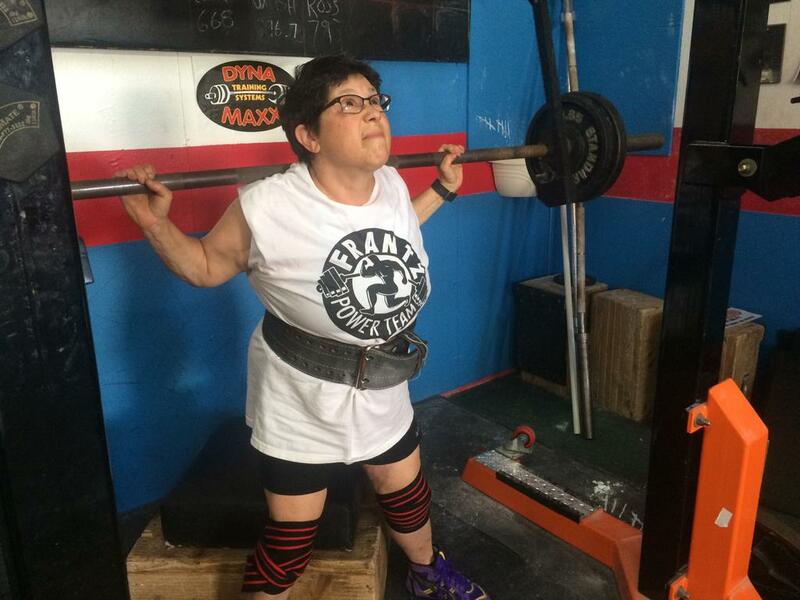 What sounds like a punchline is actually her reality: a powerlifting rabbi named Braun. Braun, who is the spiritual leader at Temple Beth El in Portland, is very aware of the contradiction in her identity. Her two paths have a similar theme, though. Braun, who turns 60 next week, makes room for herself where others like her have previously been unwelcome. Braun was part of the first class of women admitted to the rabbinical program at the Jewish Theological Seminary in New York, where she received her master’s degree in Judaic Studies. She was ordained in 1988 and became rabbi at Temple Beth El in 1994. Five or so years after moving to Portland, Braun began strength training with Matt Israelson, who owns Dyna Maxx gym in Westbrook. After years of doing exercises to maintain basic health and wellness, Braun developed an interest in powerlifting. “The minute I let out that I might want to do this, everyone was on top of me,” she said. The gym, at 120 Main St., has 40-50 members, Israelson said. Braun said they’ve become like a family, and with their encouragement, she started powerlifting four years ago. When she started, Braun could dead-lift 135 pounds. She trains four days a week, is now lifting 248, and is close to reaching her goal of 253 pounds. After 18 years of working together, Israelson said the biggest change he’s seen in Braun since she started powerlifting is her motivation. He said she now sets goals for herself and is determined to reach them. Braun has noticed this in herself, too, and said it’s changed the way she thinks about her progress. Competitions are another new aspect of Braun’s life. Her first powerlifting meet was in 2015 and her next is Aug. 5. She typically enters the masters class for older women. With most powerlifters in their 20s and 30s, Braun said she’s not only shocked that she chose to do this in her 50s, but that she chose to do this at all. “I never imagined at any stage in my life I’d be doing this,” she said. Braun said she didn’t start powerlifting so she could compete, but now enjoys it greatly. Israelson hosts meets in Westbrook and said lately 30 percent of the competitors are women. Additionally, half of the members at Dyna Maxx are women. “This gym is really special in that it accepts all kinds of people,” Braun said. This applies to identities beyond gender, she said. Braun said being a powerlifter and a rabbi go hand-in-hand for her. She said she often borrows from powerlifting when trying to balance her duties as a rabbi. Powerlifting, while difficult, has also given Braun a space to relax.